Christmas is just round the corner. For some it is a chance to relax with friends and relatives and retreat from the every day hectic work pace. A common family tradition is Christmas baking and most of us have probably taken part in it at least once, with a more or less successful result. Personally, I’m not a big fan of the whole Christmas baking thing, but since my girlfriend loves it I usually end up doing it anyway. In the following text you will take part of the result, from idea to realization. 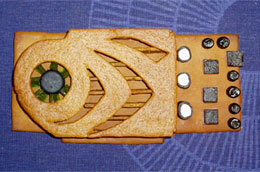 The Gingerbread PC will be published in two parts. The first part of this article focuses on building the processor, heatsink, memory, graphics card and the mainboard. In the second part we will continue with the case, power supply, CD/DVD-player and the harddrive.